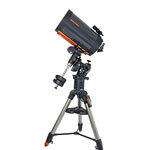 The CGE computerized series is Celestron's newest line of observatory class Schmidt-Cassegrain telescopes. Offered in 8", 91/4", 11" and 14" apertures, they all come mounted on the state of the art CGE GoTo German Equatorial mount. 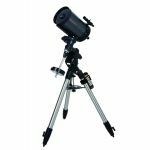 The German Equatorial mount has long been the favored choice of astronomy buffs and astrophotographers because of its stability and portability. More stable because the center of gravity is directly over the center of its base, more portable because it can be broken down into smaller component parts for easy storage and transportation. 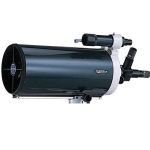 For astrophotography, the German Equatorial mount offers easier balancing, unlimited space at the rear of the telescope tube to mount a camera, and whole sky access. 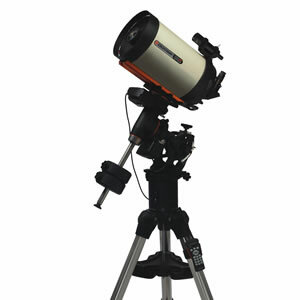 Now you can enjoy all of the NexStar software and database features with the extra stability and portability of a German Equatorial mount. Portability - Set up and transportation of the CGE telescopes is made easy by separating the CGE instruments into smaller, easy-to-carry components. 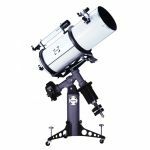 Unlike fork arm mounted telescopes, the CGE's optical tubes can be quickly removed from their mounts making even the CGE 1400 easily assembled by only one person. Stability - Recognized for superior stability, German Equatorial mounts place the center of gravity directly over the tripod legs and can be easily polar aligned without the use of an optional equatorial wedge. This proven design reduces the "tuning fork" vibration that can be associated with undersized fork mounts. 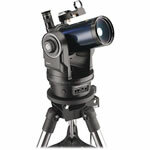 An improved Super HD Tripod supports the CGE mount. This fully extendable tripod is made from the finest cold rolled carbon steel and can be raised to a height of 50". The tripod uses a dual leg support for maximum rigidity with an upper leg brace to provide an outward preload and a lower leg brace providing inward tension. Balance - CGE equatorial mounts can easily be balanced in both axes. Simply simply sliding the counterweight for Right Ascension and moving the optical tube along its dovetail mounting for Declination accomplish balancing the weight of camera equipment and other visual accessories. 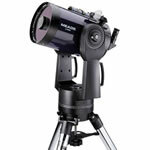 This means that no additional weight needs to be added to balance the telescope when additional accessories are added. Clearance - CGE mounts support their tubes at a single contact point allowing the tube to move freely around its polar axis without making contact with the telescope's mount. 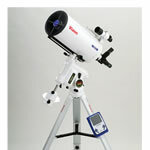 This is particularly useful when adding photographic and CCD instruments that extend from the rear of the telescopes. 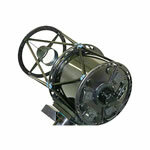 All CGE mounted telescopes are compatible with Celestron's CN-16 GPS accessory. Combine the GPS and built-in Hibernate mode and these telescopes will keep track and remember their exact location and time without having to enter the information into the hand control. CNC machined aluminum and stainless steel components Autoguide port, PC port and auxiliary ports located on the electronic pier. Drive Motors - Made in the U.S.A., Pittman LO-COG brush-commutated DC motors offer smooth, quiet operation and long life. The motor armatures are skewed to minimize cogging which is required for low speed tracking. Windings are resin impregnated for greater reliability in incremental motion applications. Precision Bronze Worm Gear - 32 pitch, 5.625" pitch diameter, 180 tooth bronze gear manufactured in the U.S.A. by W. M. Berg, Inc. Manufactured to AGMA Quality Class 10 standard, which minimizes total composite error and backlash. Bearing and Shaft - Stainless steel worm shaft has 0.4375 pitch diameter and is preloaded with two ball bearings. The worm is made from a single piece of steel (rather than a two-piece worm-and-shaft assembly) to minimize run-out, which is a source of periodic error. Schmidt-Cassegrain mechanism that moves the primary mirror to adjust focus is supported by two pre-loaded ball bearings, minimizing the "mirror flop" typical of bushing focus mechanisms. Adjustable height: 36" to 50"
Upper leg diameter: 2.75"; lower leg diameter: 2.375"
40,000+ object database with 400 user-defined objects. Features include: Compass Calibration, Polar Alignment routine, Database Filter Limits, Hibernate, Auto North and Level, Quick Align, and user-defined slew limits. Hibernate - maintains alignment even while powered down. Polar alignment routines for Northern and Southern hemispheres. Filter limits - displays only objects above the horizon. Permanent programmable periodic error correction (PEC) - corrects for periodic tracking errors inherent to all worm drives. Smooth ramping of slew motors to reduce wear on the drive train. Home sensors on R.A. and Dec axes. Fail-safe slew limit switches in R.A.
Real-time clock - maintains time even when powered down. 12VDC Servo Motors with integrated optical encoders with 0.11 arcsecond resolution. 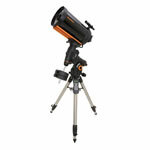 Celestron Telescope CGE Pro 1100 Schmidt-Cassegrain, with Computerized Mount, GPS compatible.